The other day I was waiting for some to-go food from a local dine-in/carryout restaurant. I was standing near the counter when a fellow patron – having just finished his meal – approached the counter and asked, “Do you guys have to-go cups?” The owner’s response was a quick, unfriendly and very matter-of-fact, “No.” Of course there are a dozen other (kinder) ways that owner could have responded to the request (or better yet found some container with which to improvise) … but no such luck. Too often our frontline product and service providers are quick to say no. Sometimes, we’re even left with the feeling that they get some kind of satisfaction out of taking on this sort of can’t-do attitude. Below is one famous restaurateur’s answer to this all-too-common failure to serve. While reviewing customer feedback, Meyer realized his diners’ #1 complaint was not being able to secure the reservation time they wanted. Think back on your own experiences of making restaurant reservations – especially in the pre-Internet days, when the only way to do it was by telephone. There usually isn’t a problem solver on the other end of the line, is there? Instead, you’re often on the receiving end of a cocky, can’t-do response (or a least an unhelpful tone) when the reservation book is full. “I understand how you feel and I wish I could just move you to the top of our list. 8:45 p.m. is the earliest slot available, but if you can provide a ‘window’ that might work for you, I’ll be rooting for a cancellation so that we can move you to a more suitable time slot.” Simple … yet impressive. I believe one of the main reasons front-line staff react the way they do is because they get so many of the same (seemingly stupid) questions over and over again. If you can get your team to return to their “beginner’s mind” and act as if every time is their first time fielding a client concern, I believe they’ll naturally express more empathy. It’s so important to remind ourselves that while we may be saying something for the hundredth time … it’s the customer’s very first time hearing it. We should always be sensitive to that. By the way, this works from the other side of the counter, too. A few days ago, I was trying to book award travel with United Airlines. My representative was not particularly kind or helpful in the beginning. But once I took an “I’m on your side” stance – expressing empathy for her and the antiquated process she must undergo in order to book travel with partner airlines – her tone almost instantly took a 180-degree turn for the better and she began offering ideas and solutions. 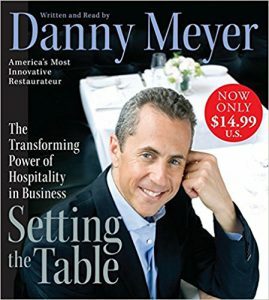 I first read – or, more accurately, listened to – Danny Meyer’s book, Setting the Table, about five years ago. Clicking the link will take you to the Amazon.com page for the audio version, which is read by the author. At about $15, I think it’s an incredible value.